In the early 1930’s rubber tires on farm equipment was an absurd idea. 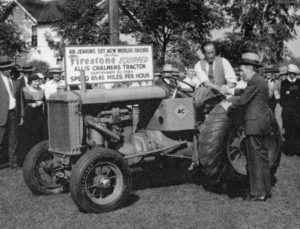 But Harvey S. Firestone had a vision to “Put the Farm on Rubber” knowing it would save the American farmer money and increase production. Harvey personally oversaw the research, development, and experimentation of this project, much of which was done on his farm in Columbiana, Ohio. This 1937 Firestone Catalog picture shows the types of equipment used in the research, development, and experimentation. 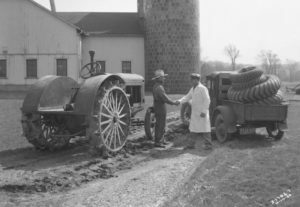 The Ohio State University was involved with the testing of rubber tires on Harvey’s farm. In 1932 Allis Chalmers was the first tractor manufacturer to offer rubber tires on their Model “U” Tractor. 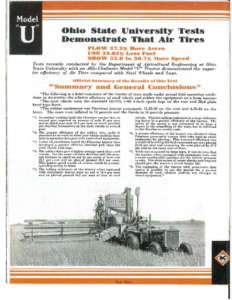 In order to convince the skeptical American Farmer that rubber tires were far superior to steel wheels, Allis Chalmers and Firestone launched a brilliant marketing campaign. 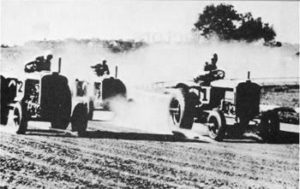 They employed racing legend Barney Oldfield, and land-speed daredevil Ab Jenkins to run modified “U” tractors in speed demonstrations across the country. The tractors were fitted with a special high gear that allowed the machine to reach 60 plus mph. Barney Oldfield set a land speed record of 64 mph in 1933, only to be out done by Ab Jenkins a year later. Harvey congratulating Ab Jenkins on his record setting run on Firestone tires. This picture was taken at the Firestone Homestead in Columbiana, Ohio. Some people are born into wealth and prosperity. Others pave their own way…. 1828: The Firestone homestead is built by Nicolas Firestone in Columbiana, Ohio. 1868: Harvey Firestone is born. 1882: Firestone homestead is renovated. 1887: Harvey Firestone graduates from Columbiana High School. 1900: Harvey Firestone moves to Akron, Ohio and creates Firestone Tire and Rubber Company. 1919: The U.S. Army Transcontinental Motor Convoy, lead by Lt. Colonel Dwight D. Eisenhower, stops at the farm. 1933: Harvey Firestone donates 52 acres for, what is now known as, Firestone Park. 1953: The Firestone Test Center is opened, adjacent to the family farm. 1965: Harvey Firestone’s descendants and the Columbiana Historical Society renovate the original homestead. 1983: The homestead is moved to Greenfield Village in Dearborn, Michigan. 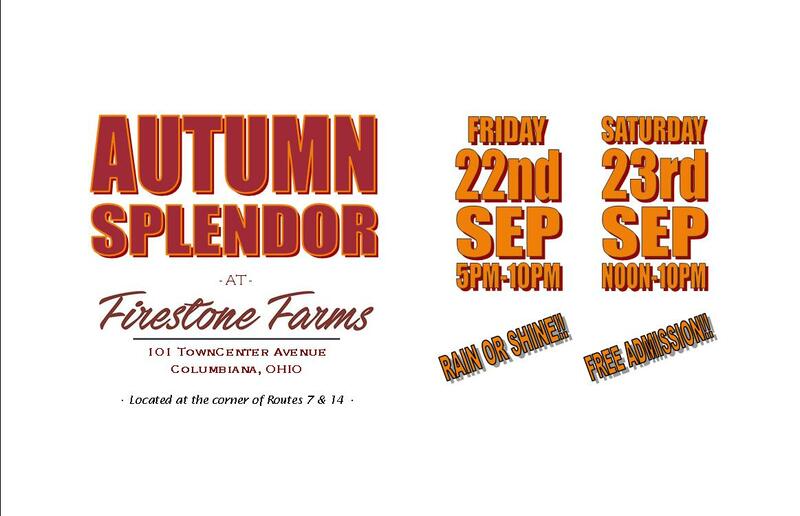 In 1828, Nicolas Firestone, grandfather to Harvey S. Firestone, built a farm in Columbiana, Ohio. The farm raised sheep, and also harvested oats, hay, corn, and wheat. In 1882, the homestead was renovated to reflect a more stylish and up-to-date look. New furniture, the addition of rooms, and wallpaper were all part of the renovations. Born in 1868 and raised in the rural town of Columbiana, OH, Harvey Samuel Firestone’s childhood was nothing out of the ordinary. H grew up with two brothers and a sister on a large farm built by his grandfather, but unlike most people during this time period, Harvey graduated from high school and went on to complete a college-level business course in Cleveland. His life’s work in the tire industry gained ground when he began working in sales for his uncle’s carriage business. Within a few years, however, Firestone began to notice a shift within the transportation industry. As a result, he adjusted his focus toward building a company that could produce tires for automobiles, rather than carriages. With $10,000 of his own money and a patent that he had received for attaching rubber tires to wheels, Firestone moved to Akron, OH (which was the center of rubber tire manufacturing in the 1900’s). From those two things and one small move, the Firestone Tire and Rubber Company was born. In 1904, Firestone’s company began to manufacture its own tires and saw a marked improvement in the quality of the product. Thanks to some savvy business sense, Firestone soon pioneered the mass production of tires, and in 1906, received a large tire order from Henry Ford. A life-long friendship and business relationship developed, and by 1913, Firestone was making millions of dollars in profits. His company was hit hard by the depression, but he was able to make it through and began to, once again, turn a profit again. 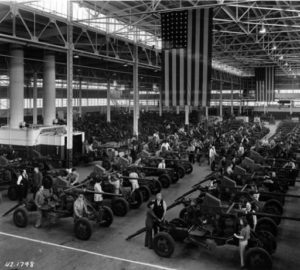 By the 1930’s, Firestone had twelve factories in the United States and five abroad making rubber, steel and textiles. Harvey S. Firestone helped to modernize the tire industry, ultimately launching him into the world of the elite, but, he never forgot where he came from. 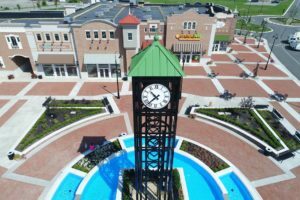 He continued to provide generous donations to the Columbiana, OH community, including the donation of land that eventually became Firestone Park. Additionally, the land on which his family once resided is currently being developed into the premiere residential and shopping destination of the region. Inspired by Harvey’s revolutionary spirit, this community, known as Firestone Farms, will continue to honor the memory of this great man, who did so much for his hometown, as well as for the world. The dismountable rim, which allowed the wheel and tire to be removed together. Thus, the spare tire was born. The idea of the one-stop, master service store, designed to provide tires, gasoline, oil, batteries and brakes through a single outlet. These stores eventually began to offer auto services, as well. Harvey S. Firestone was a truly brilliant visionary whose bright mind and strong business sense helped to navigate the world through many trials and tribulations. His impact is far reaching and his insights continue to be relevant nearly a century later.